Pound Stretcher It has streamlined its offer to provide its target market with a variety of good quality product ranges at affordable and competitive prices. Everyday clothing and footwear for the family has been established as part of the core offer together with the other two core offers of domestic hardware and household textiles and also a selected range of toiletries, confectionery and entertainment products, stationery and toys. Store profitability has increased substantially. INSTORE PLC is the trading name of formerly Brown & Jackson plc. 25 February 2006. 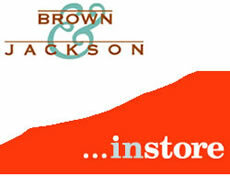 Brown & Jackson INformation website Brown and Jackson Plc is now instore plc.